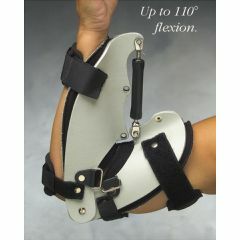 Small 7 1/2"-9 1/2" Large 12" - 15"
The Progress-Plus Elbow Turnbuckle Orthosis is ideal for post-surgical repairs, contractures or abnormal tone conditions affecting the elbow. Turnbuckle design provides infinite adjustability for static progressive positioning. Simply screw the turnbuckle in or out to position the elbow at any point between 0° extension and 110° flexion. No tools are needed for adjustments. Kydex outer shell for optimal force distribution, stability and durability. Removable, washable, nylon-covered neoprene liner provides comfort and protection. D-ring hook-and-loop fastener(s) straps for easy application and fitting. Fits either the left or right arm. To size, measure circumference at the forearm and at the biceps. Use orthosis length as a guide. Small: Length 12" / Forearm 7 1/2" to 9 1/2" / Biceps 8 1/2" to 11"
Medium: Length 14 3/47"/ Forearm 9 1/2" - 12" / Biceps 11" - 14"
Large: Length 16 1/4" / FOrearm 12" - 15" / Biceps 13" to 16"
NC33800 - Small 7 1/2"-9 1/2"
NC33802 - Large 12" - 15"